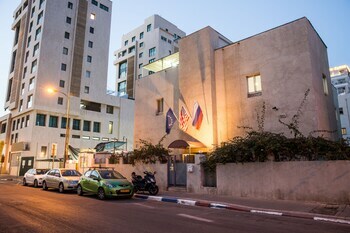 Located in Tel Aviv (Tel Aviv Promenade), Trio Tel-aviv is within a 15-minute walk of Carmel Market and Frishman Beach. Featured amenities include express check-in, express check-out, and dry cleaning/laundry services. A roundtrip airport shuttle is provided for a surcharge (available 24 hours), and self parking (subject to charges) is available onsite. With a stay at NETANYA MOTEL PIERRE in Netanya, you'll be a 2-minute walk from Inter Active Atzmaut Square and 6 minutes by foot from Netanya Amphitheater. Located in Tel Aviv (Tel Aviv Promenade), Renovated White House - Banana Beach is within a 15-minute walk of Carmel Market and Frishman Beach.